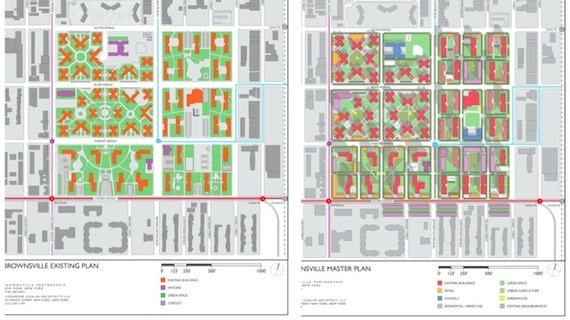 A plan put together by the organization Community Solutions, which is ##http://cmtysolutions.org/blog/hope-grows-brooklyn-0##working in Brownsville## to prevent homelessness before it starts, would remap streets through superblocks and use infill development to revitalize an area dominated by public housing. Existing surface parking lots would be turned into housing, retail, schools and green space. Leaders in New York City’s public housing community are interested in transforming city-owned superblocks into mixed-use, mixed-income communities that engage with the pedestrian realm. There are of course many obstacles to this kind of ambitious project, but only one was identified specifically in a Municipal Art Society panel on the topic last Friday: the city’s own parking requirements. Infill development also would allow the city to undo some of the design drawbacks of the tower-in-a-park style housing project, common in many parts of the city. A plan put forward by Rosanne Haggerty, the president of the homelessness prevention organization Community Solutions, for four adjacent housing projects in Brownsville would build between 700 and 1,000 units without displacing a single resident, she said. Her organization’s design would break up the existing superblock by restoring the original streets back through the housing project and put new buildings facing the sidewalk, recreating the traditional pedestrian environment. “Those blocks can reknit into the surrounding street grid,” said Haggerty. Surface parking lots would be replaced with new housing, retail, schools and green space under Haggerty’s plan. NYCHA is able to pursue some infill projects despite DCP’s parking requirements, but Rhea said it’s difficult. According to a 2005 report commissioned by the city, NYCHA has abandoned recent attempts to build out some of its sites due to parking minimums. At the St. Nicholas Houses, said Rhea, the authority was able to build a new school with the Harlem Children’s Zone on top of a former parking lot because a remapping of 129th Street — the first remapping of a street through a public housing superblock in the city’s history — provided enough new on-street spaces to compensate for the lost lot. George McCarthy, the director of the Ford Foundation’s Metropolitan Opportunity portfolio, said that he works in nine regions trying to connect public housing residents to good transit. “It really begs the question about parking,” he said, given that New York City’s public housing generally already has such good transit access. He called for eliminating the requirements and allowing NYCHA to build parking only as needed. “Why do we continue to permit ourselves to build institutions that hamper our ability to provide enough housing?” McCarthy asked. Seems like this would be a great issue for Amanda Burden to get out in front on and simply start talking about and working on. What does she do all day, anyway? Amanda Burden should be ashamed. New York City could be building more affordable housing and healing scars from the urban renewal era. Parking minimums imposed on NYCHA prevent this from happening. The city paid for a report that highlighted the problem six years ago. Has Amanda Burden lifted a finger to actually solve it? ive said it before. forget about parking requirements. NO PARKING at all. if you can not afford a home on your own, and require NYCHA assistance. why should NYCHA provide parking for you when the money is better off not owning any car at all. any publicly assisted housing should be built with ample green spaces. not tar and gravel for cars. Very glad to see this coverage. Making the parking lots that surround a lot of the public housing structures work *for* the residents would go a long way to making the areas more walkable and livable in general, and it could make it easier for the few non-vulture businesses that are willing to provide services in these areas to thrive. We have literally built moats around poor people, and one of the many effects is a reliance on car ownership that continues the debt spiral. I’m glad there are people who have a vision for how to improve and transform the superblocks that public housing are built on. Other cities ended up tearing down their public housing projects because no one wanted to live in them. In NYC, public housing is filled and is popular with waiting lists, so there is no chance of tearing it down. Yet, the design of superblocks and huge towers of public housing have problems: poverty is concentrated all in one place and there is little opportunity for gentrification. The idea to have income diversity by combining middle income with low income would help; I am impressed with the idea. Also, restoring the streets and having retail would also help. Especially since NYCHA has no money yet has an unfunded mandate to provide housing below its true cost, NYCHA needs to be given the freedom to capitalize on the land they have and derive income from it so that they can continue to provide housing low income people. =v= After years of foot-dragging, San Francisco came up with a policy in which one little region of the city — dense and well-served by transit — would actually limit the parking requirement. The very first project that came up asked for a variance because developers had no idea how to build something that didn’t accommodate cars! cars! cars! They got their variance, in part because they set aside two whole parking spaces for Zipcar, the eco-grooviest venture in human history, apparently. daphna, the public housing (projects) of nyc are a horrible place for anybody to live. jail is probably more comfortable as most of the apartments are filled with roaches, vermin, etc… (and im talking about the humans). most ppl in the projects dont give any respect to one another. you made a good point that its because of the towering huge towers the projects are and when you concentrate a bunch of folks that never want to get out of poverty. it becomes a haven for crime, gangs and drugs. now certainly there are some public housing that is far from what i mentioned. there are many seniors who live on public housing that are not in these huge ghetto towers which are relatively safe and actually pleasant to live in. take for example the nych apartments close to lincoln center. here you have a public housing building next to an art/recreation facility. but there is no denying that if you need public assistance housing, there should be no subsidies for car and car parking. you already are on assistance for housing. why should the state subsidize for car parking as well when the alternatives can be parks, and other recreational facilities. the parking lots, even certain subway stations are underneath buildings, eliminating parking could further marginalize the projects, although many residents don’t use cars, outside of manhattan they are somewhat of value, parking is not free, it costs hundreds of dollars a year, a great deal but if your income is limited then not so great. Perhaps eliminate or reduce parking in manhattan, and consider building over many lots, and consider limiting spaces or increasing fees in other boroughs, not every pha has great transit access such as sheepshead bay, if you want to go shopping at outlets outside of nyc or in the other boroughs, it can be difficult without a car. If you’re living in these housing projects you would be better off not spending thousands of dollars a year on a car. Or a street grid so residents have access to jobs, stores, and other necessary things. Currently most housing projects are dead zones.